There is quite a diverse habitat out there when it comes to penguins. There are species that can live in extremely cold conditions and those that live in much warmer regions. Some can live in Antarctica where conditions make it very hard for very many types of creatures to survive at all. There are also those that live in very temperate areas such as the Galapagos Islands – home to the Galapagos Penguins. The habitat and distribution of penguins seems to be very widespread due to their adaptability. They have a body that is covered with feathers, offering them protection from the water and from the cold air. What is very interesting about the distribution of penguins is their size. Studies show that the Bergmann’s Rule does apply here. At the higher latitudes, you have the larger sized penguins. At the lower latitudes, you have those that are significantly smaller in size. The main locations where penguins live include South Africa, Antarctica, New Zealand, Australia, and Argentina. Most penguins live on islands and of course they have to live close to water. They spend time both on land and in the water. They get their food in the water but often socialize on land. They will also create nests on land to lay their eggs. There isn’t any species of penguin that has the ability to fly. The amount of time that is spent on land or water varies by species. Some of these penguins spend only ¼ of their time on land. When food supplies are short, then some species have to spend more time in the water than before. They have to continue to search for food so that they can survive. An abundance of food supplies is vital to the overall survival for penguins and they will live in areas that can offer that to them. They tend to eat much more than they need, but there is a purpose for that taking place. Penguins have periods of time when they must fast. This includes molting where they need to stay on shore so that their new features come in. They also fast during various segments of the mating process and the young being born. Their habitat must offer them enough food for them to store up fat so that they can survive during those periods of time when they won’t be in the water to feed. As a result, some species of penguins engage in migrating. They may have to move from the rookeries they are used to so that they can find coastal waters that offer them enough food. The distances they travel can be extensive. This has been observed in a couple of species including the Humboldt Penguins and the Magellanic Penguins. 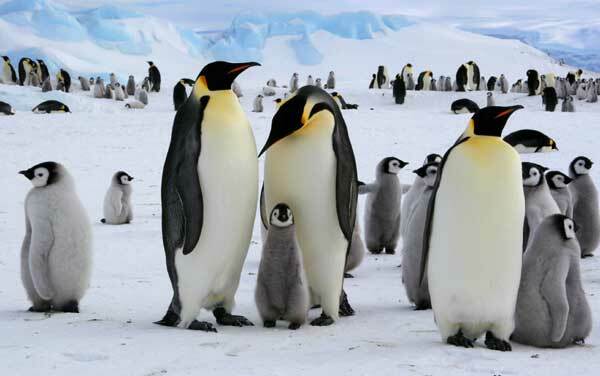 Due to the social nature of penguins, they live in colonies. There can be hundreds or thousands of them in any given location. They seem to have a hierarchy that works very well for them. There are plenty of sub units within the overall culture too. The habitat is one where males and females interact on a regular basis. In fact, the males play a vital role in the overall care and survival of the young. Environmental factors play a huge role in the survival of the penguins in any given location. When there are huge changes in the environment is can be very harsh for them. One example is in Antarctica where they depend on the ice pack for them to make a long journey to their breeding grounds. With warmer temperatures and melting issues, this has proven to be much harder for them than in the past.